Pizza with the works. Make it gourmet at home with fresh toppings like mushrooms, tomatoes and onions. We didn't forget the pepperoni and black olives on this pizza! Cook and stir vegetables in 1 Tbsp. dressing in skillet on medium heat 3 min. Place pizza crust on baking sheet sprayed with cooking spray; brush with remaining dressing. 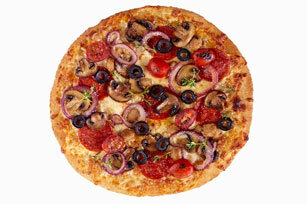 Top with cheese, pepperoni, vegetables and olives. Bake 10 to 12 min. or until cheese is melted and edge of crust is golden brown. Sprinkle with thyme.